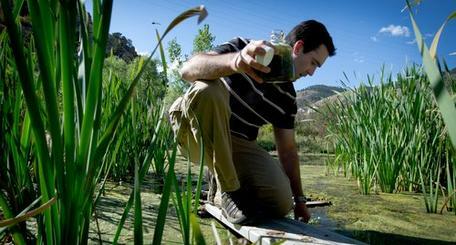 Algae Prospecting NREL researcher dips through slime to capture algae samples. Algae could produce hydrogen and biofuel that might someday power America's transportation fleet. better prepare students for the 21st-century "Big Questions" that relate to real-world challenges such as energy, air and water quality, and climate change. From the main search screen you can browse through the collection using the terms on the right of the screen. This search tool not working as you like/expected? The lack of scientific literacy is helping humans cause a dangerous disruption of the thermal stability of the planet. Students do not understand the threats to our ecosystems that we all depend on for life. Each educator has a unique and important opportunity to help our students understand the need to use knowledge to care for our global commons and help create a sustainable future. The Beginner's Toolkit provides a starting point for faculty to explore the benefits and opportunities of joining their colleagues in including content and activities about urgent real-world challenges in undergraduate courses. View the Key Components of Sustainability Assignments when designing or incorporating new sustainability assignments into your course. Empowering Students to engage in authentic solution-building increases capacity to learn and to transfer skills to real-life scenarios. Disciplinary Perspectives on teaching sustainability provides a place to begin finding resources either within our outside of your own discipline. These resources include teaching activities, course descriptions, example programs, continuing education, and additional resources. If you don't see a particularly good resource that you use in teaching about sustainability, you can also share a sustainability resource with a description of why and how you have found it useful. Download the original resource list (Microsoft Word 2007 (.docx) 98kB May13 15) that helped inform the SISL website and includes some additional resources. 2012 Math for a Sustainable Future Workshop began with a December 2012 Webinar and continued with in-person meetings March 15-17, 2013 in Washington, DC. Participants generated a collection of math problems and learning activities that can be utilized by educators in developmental math through calculus and a variety of other academic disciplines. "'USE Math on Campus" is a PREP (Professional Enhancement Program) sponsored by the Mathematical Association of America, July 22-26, 2013. At this workshop, faculty explore the connections between applied math and sustainability and develop classroom activities and modules on individual and campus sustainability issues and decision-making. If you want students to learn and to become passionate about the subject you teach, celebrate what it can do to help solve urgent societal problems. Join your colleagues and academic society in empowering students to contribute to a better society, by providing students authentic opportunities to make a positive change in their communities. Contribute an Activity allows you to help students beyond your own classes learn sustainability topics. Here you will be guided on how to share your favorite sustainability teaching activities, with questions prompting you about how to use the activity in class, and you will easily be able to upload files, as well. Share stories of people from your discipline who have contributed to a more sustainable planet. Share a sustainability resource with a description of why and how you have found it useful in teaching sustainability.